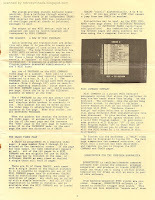 Moog Song Producer 12-page introductory guide/brochure from September 1985. 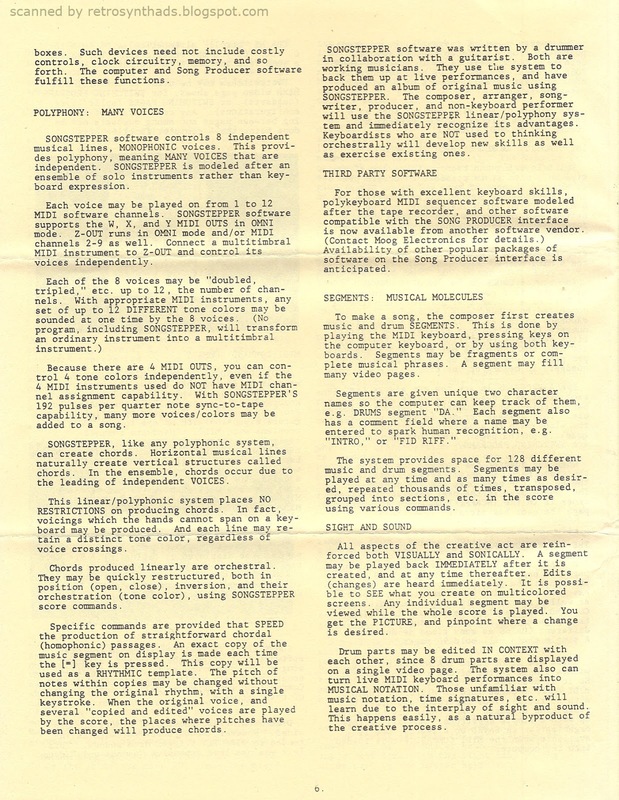 Today I thought I'd keep the whole Moog Song Producer fixation going by focusing on one of the documents that apparently came packaged with every unit - the introductory guide. 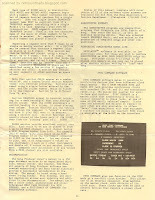 That's the yellow folded document in the bottom right corner of the photo. I've labelled the other pieces in the caption below the photo in case anyone is interested. 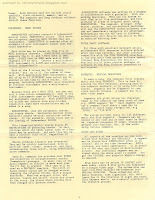 I'm sure I'll get to some of the other documents in future posts, but for now, lets unfold that introductory guide and see what's up. Once unfolded, it's the photo on the front page that directs the eye's attention. This is the same photo that gets passed around *a lot* in Facebook synth forums and elsewhere - yellow paper background and all. Who can't appreciate that Song Producer hardware sitting atop a "portable" Commodore SX-64, with a large 5 1/4 inch floppy sitting askew on the keyboard? For me, it doesn't get much better than that. I'd always wondered where that image had originally come from. So imagine my surprise when I unfolded this brochure for the first time and there it was! Made me quite happy. 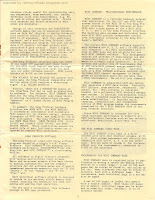 The document itself is quite long - some may say "wordy". And that might be an understatement. But, it is a quick-start guide in the same vein as the also-wordy 250+ page manual, so its not really a surprise that it gets into so much detail itself. Point being, I'm gonna skip everything between page 1 and 11 in this post. 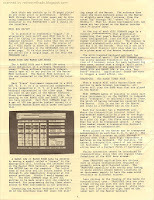 Read it all at your leisure to learn a great deal on how Song Producer worked. For now, jump right to back page., because that's where the real fun begins. First, I'd like to take a long lovingly gaze at that image in the middle of the page. Did you see it? Isn't it twenty kinds of awesome? No. It's not. Moog has a history of creating great illustrations to promote their products, like this one from 13 years earlier (see right). Love both images so much I tweeted both pieces of artwork the other day. 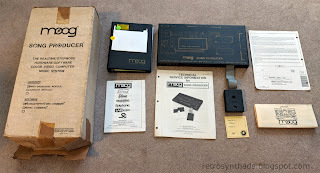 "At Moog Electronics, Inc., we believe that MIDI interfaces with only MIDI IN, OUT, and THRU connections should NOT become the "standard" for musicians. The Song Producer's MIDI/DRUM/SYNC module and bundled software package are an important step that extends the usefulness of many devices orphaned by simpler MIDI interfaces. It also solves many of the problems with MIDI. Significant third party software is now available for this interface. The general nature of the system will attract OTHER software programmers who have nothing to gain by supporting only one interface. The Song Producer Interface simply has more to offer the talented programmer. 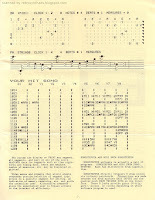 In the final analysis, musicians will vote--with their purchases--for the limitations they wish to live with." Sure, a few other MIDI cartridges had good old fashion sync, but as far as I know the Moog Song Producer was the only C64 unit that included trigger outputs - and not just one or two... but EIGHT. This is a great addition to anyone that has kept their pre-MIDI drum brains or even synths such as a Modular Moog around. 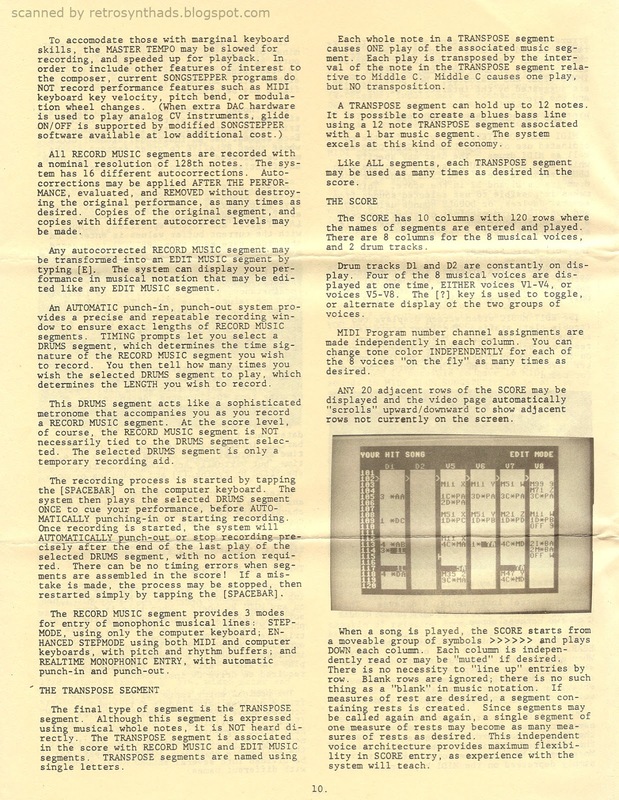 Ominously, Moog ends the brochure suggesting that musicians will vote with their wallets, and sadly Moog Electronics would loose the MIDI interface battle a few years later when the company was sold and the manufacture of all proprietary products was halted. 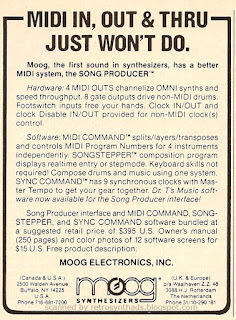 Moog Song Producer sequencer "MIDI In, Out & Thru Just Won't Do" 1/4-page black and white advertisement from the top right corner of page 101 in the December 1985 issue of Keyboard Magazine. 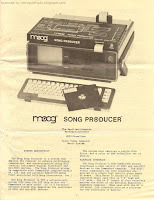 If you follow me on Twitter, you may have seen a recent photo or two of my own Moog Song Producer hardware and software. Over the last little while, I've made it a point to ignore the realities of life while learning the intricacies of this unique machine. It's taken a bit longer than anticipated - the software is a bit of a complicated beast and the fantastically detailed manual is both a godsend and a hindrance in many ways. I'm not afraid to say my tech ego has taken a bit of a beating. But I am making progress and hope to have a detailed video or two available at some point to give readers a bit more of an understanding on how the Producer worked. 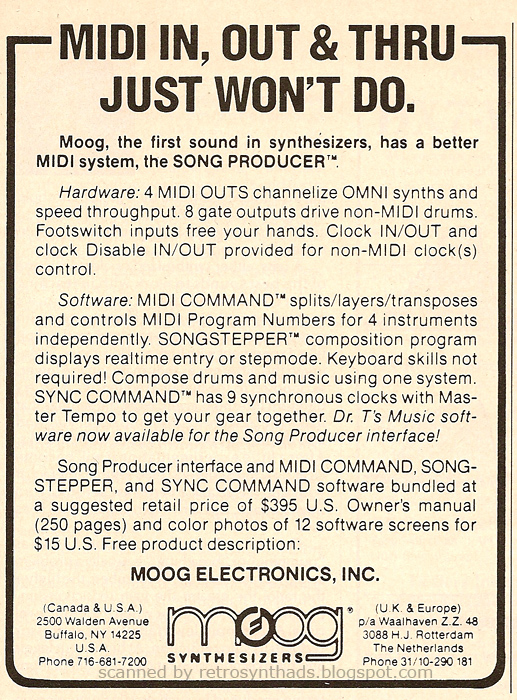 Until then, let's deja vu our way though this second Moog Producer advertisement. 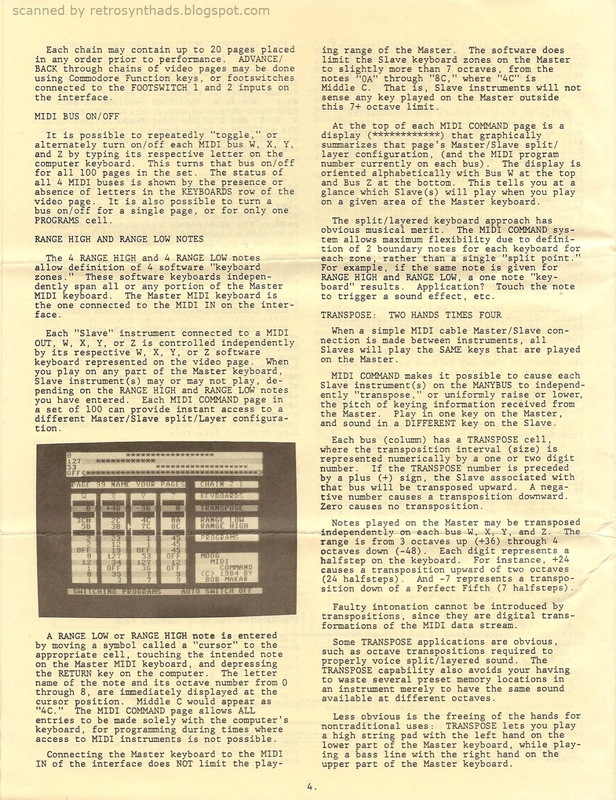 I last blogged about the Moog Song Producer in December when I posted the first product ad that appeared in the November 1985 issue Keyboard Magazine. The copy and layout in this slightly chubbier December 1985 version is pretty much the same as in the OG. 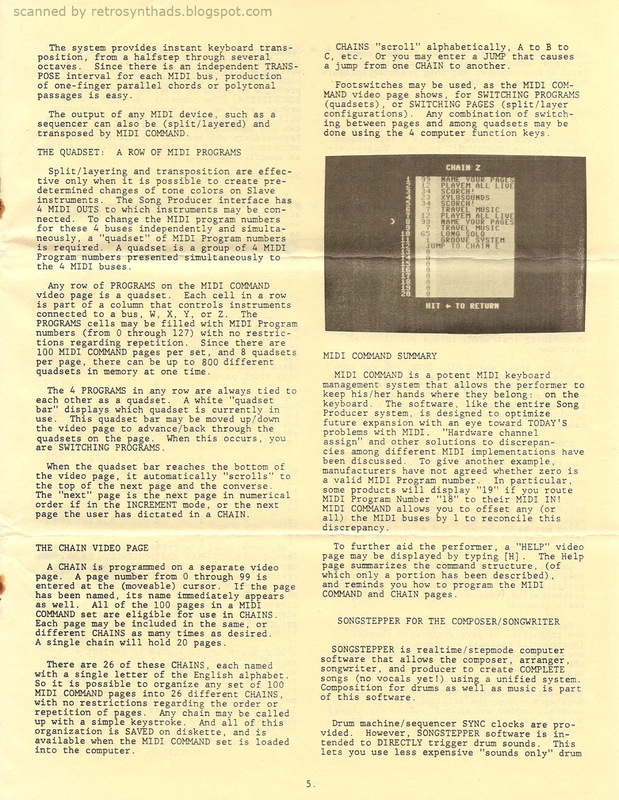 But, sadly, this last Moog Producer ad appears to be the last Moog ad to appear in Keyboard Magazine before the 1987 sale of the company and a corresponding change in strategy to primarily focus on contract manufacturing, although they did continue servicing Moog Music products. I mentioned the pricing in my first blog post, but as I read through this version of the ad, the $395.00 price tag jumped out at me a bit more. For comparison, Passport's interface with MIDI IN, OUT and DRUM SYNC went for $99.00, and Sequential 242's interface with MIDI IN and OUT, Clock IN and Start/Stop went for $129.00. Even when you add in the software (another $100-$150) there is still quite a gap in pricing with the Song Producer. So, was the extra money worth it? We are talking four MIDI OUTS. Plus MIDI IN and THRU. Clock IN and OUT. Two foot switch inputs. AND those eight drum trigger outs. But it wasn't just the hardware that made the Song Producer special. I've included a photo of everything that came with my fully boxed unit, which I believe is what was originally included in the box. 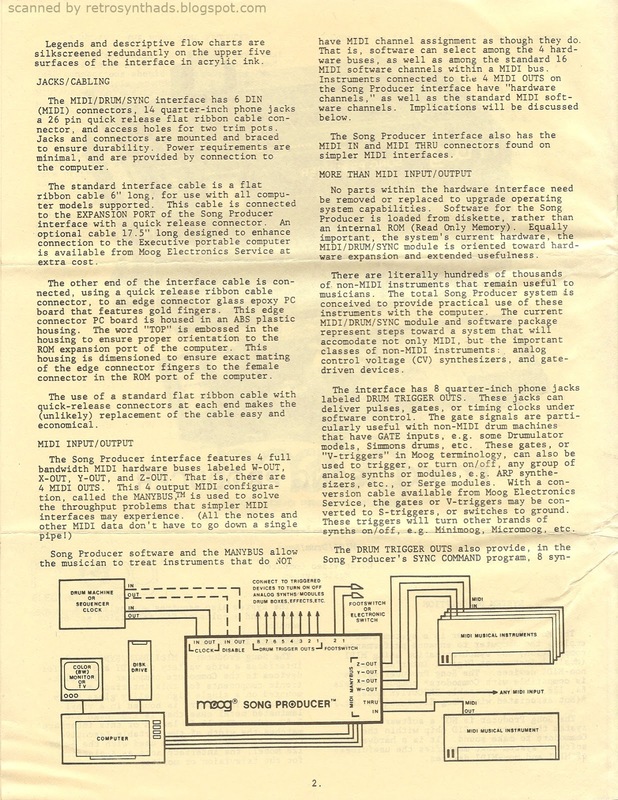 This included the 250+ page manual in a quality black three ring binder, the program disk, warranty card, introductory guide, quality control slip, technical service info leaflet (including schematics) and service location poster. Now compare that to what came with the Passport interface - a small manual, the disk and sometimes a MIDI cable. That's it! 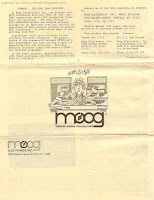 Moog has always done "quality" right. Anyways, back to some history... although these two small ads appeared at the end of 1985, avid Keyboard readers would have actually learned about the existence of the Song Producer hardware and software more than a year and a half earlier. 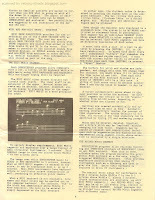 The first hint was in Keyboard Magazine's Winter NAMM '84 article that appeared in the April 1984 issue. 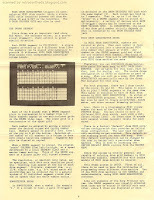 The reference in that article is small, but gives us a wack of historical info regarding changes to Moog Music at the time. 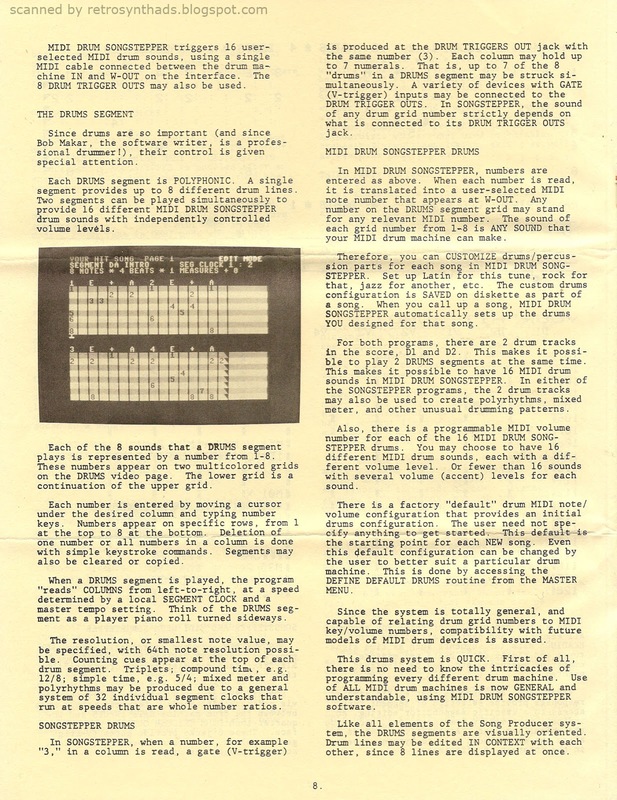 "With a new name from a recent management buyout, Moog Electronics (formerly Moog Music) showed a prototype sequencer for the Commodore 64...". 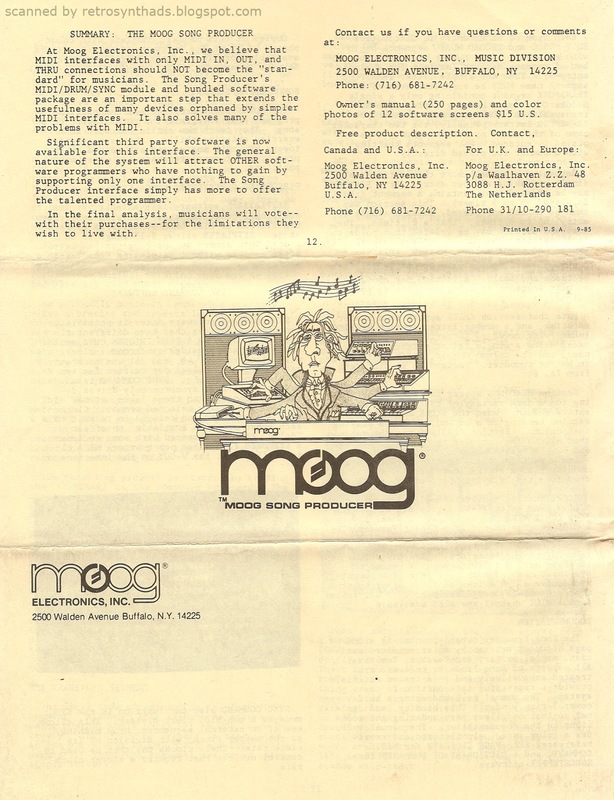 As mentioned in my previous blog post on the previous Moog Song Producer ad, the management buyout change mentioned in that little sentence occurred during the slow pivot to put more emphasis on contract manufacturing. 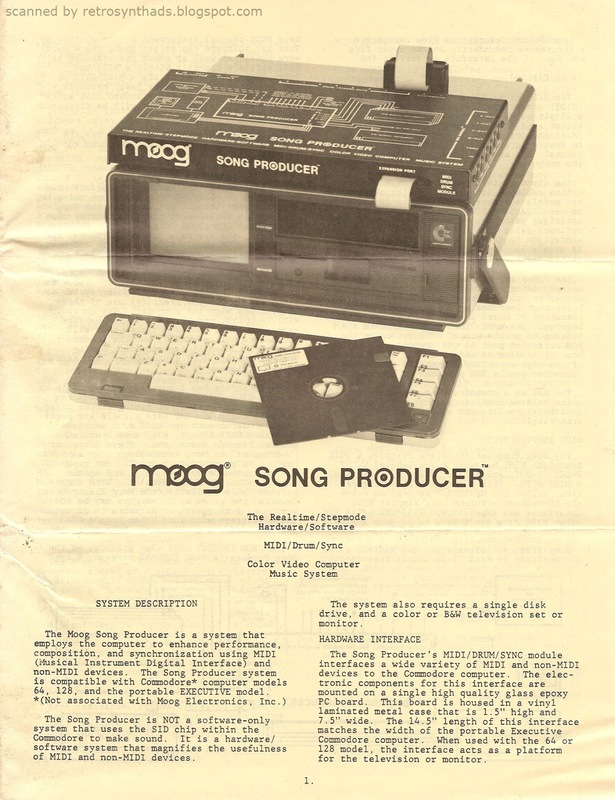 "Moog Electronics brought out a Commodore 64-based system called the Song Producer. Along with the sequencing program, the system comes with MIDI star network hardware (one input, four outputs, one thru-put), which eliminates the kinds of time delays you get by hooking up more than three or four MIDI instruments together via the thru-puts. On top of that, the system has a live performance software module that allows you to make any MIDI keyboard a split/layered keyboard with eight definable split/layer points by using a buss system which is designed to get around the whole problem of MIDI channel assignment and the current incompatibilities between various instruments regarding channel assignments. 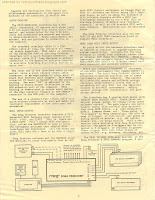 A rather useful device, and it carries a list price of only $395.00, hardware (but no the computer) included." Those two references were just a small glimpse into what readers would learn about Song Producer. Because it was then in the September 1985 issue of Keyboard that the infamous (kinda) Song Producer Keyboard review appeared. 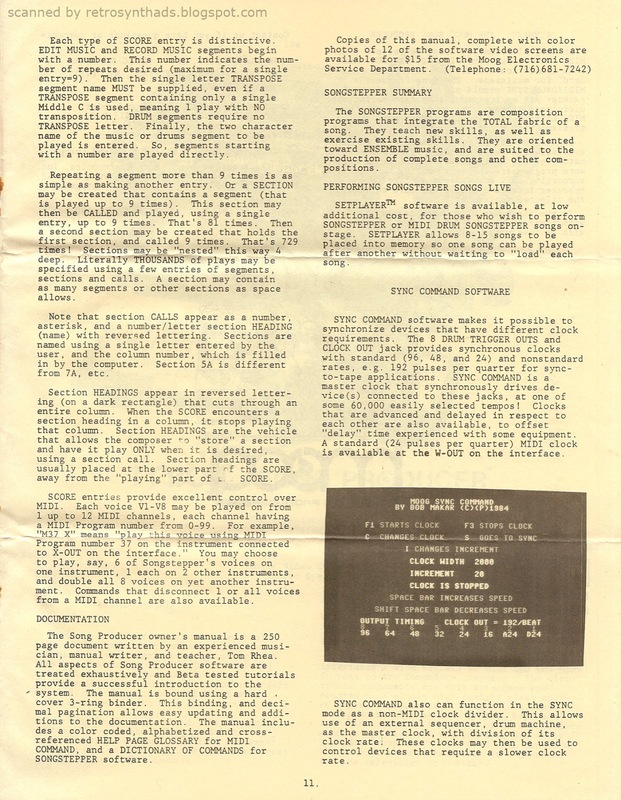 Oxford Synthesiser Company OSCar "Why would anyone buy this ugly, monophonic synthesizer" half-page black and white advertisement from page 35 in December 1985 issue of Keyboard Magazine. I love the December issues of Keyboard. They are always a slightly different beast from the rest of the months. They are usually packed with more pages and within those pages are a lot more ads. As a result, I've seen many advertisers try something a little different or take a bit more risk and step out of their comfort zone in order to break through the noise. Sometimes those ads are just a change from their normal campaign to wish readers a happy holiday or merry Xmas. Good examples are this SCI's "Happy Holiday Season" ad. 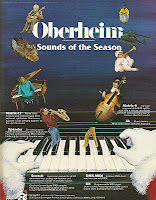 Another is this Oberheim "Sounds of the Season" ad. But sometimes, just... sometimes... readers get a real treat. And this OSCar advertisement is exactly that! 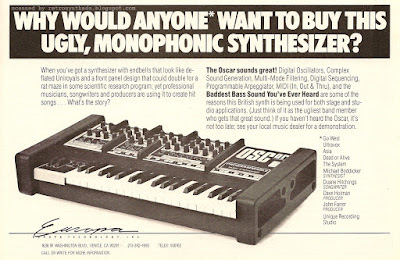 "Why would anyone want to buy this ugly, monophonic synthesizer"
Remember, this isn't 1981. Readers are on 1986's doorstep. 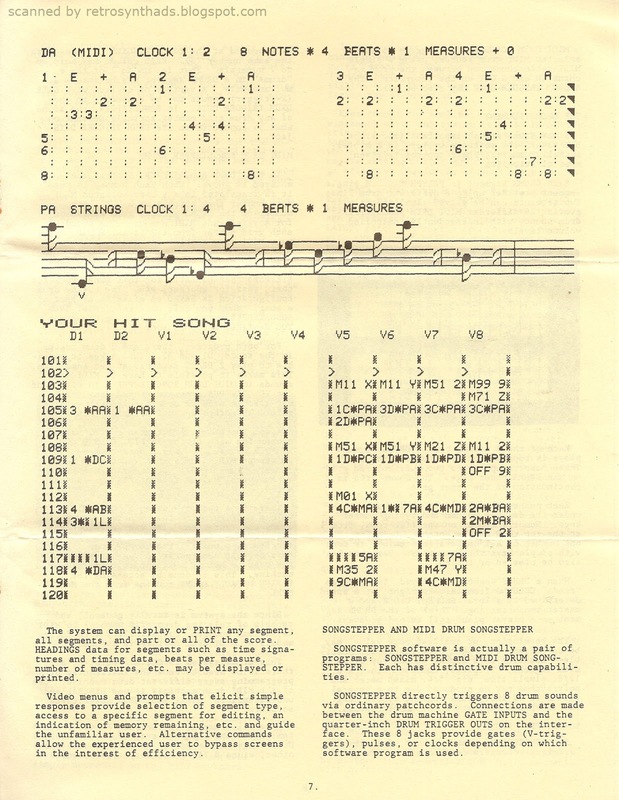 Polyphonics had not only been on the market for a while, but prices were starting to tumble. There were lots to choose from - Korg's DW series, Sequential's MultiTrak, Yamaha's DX100/21 and Roland JX3p come to mind. But being upfront and honest about your product is a great way to help cut through all that advertising clutter. A good comparison is Buckley's Cough Syrup's long running "It tastes awful and it works" campaign. You throw the reader the bad news first to get their attention, and then hit them with the good news. And that's exactly the strategy this OSCar advertisement went for. "When you've got a synthesizer with endbells that look like deflated Uniroyals and a front panel design that could double for a rat maze in some scientific research program...". That's synth comedy gold. And it works. Its only then that the ad gets to the point of the question - why would anyone want to buy it? And here's where the real pitch begins. The good news. And what is the good news? That it sounds great! As Wikipedia puts it, this is mostly due to "its many unusual features and design quirks". 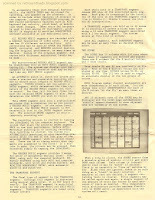 I'm not going to get into all the features and quirks here in this post, except to say that it had such good sounding digital oscillators that the book Vintage Synthesizers by Mark Vail noted "its sales took off very quickly despite the fact that it was monophonic and cost almost as much as a Roland Juno-60". 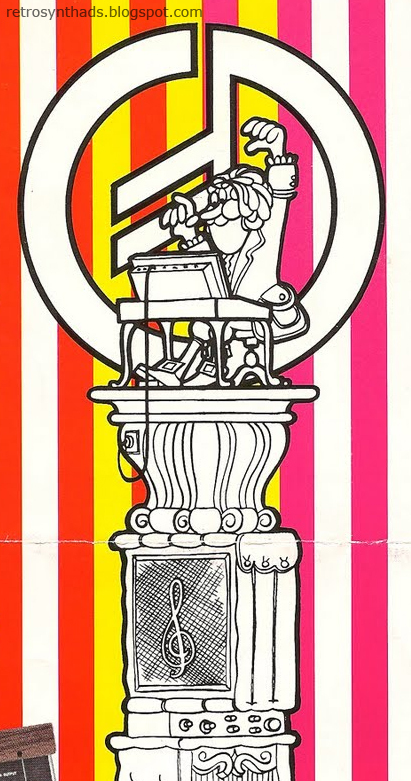 And it still sounds so good that even today the OSCar sells for the same, if not for more, than a Minimoog. Another highlight of the ad, especially if you caught that little asterisk after the word "anyone" in the headline, is that list of bands that used the OSCar - Go West, Ultravox, Asia, Dead or Alive, and the System. That's a fine list of "anyones"! But, I have to say, the most interesting thing about this ad is that the OSCar synthesizer wasn't being promoted by the company that manufactured it, the Oxford Synthesiser Company, but by their North American distributor Europa Technology Inc.
Europa was responsible for bringing some of the best European synths to North America in the 80's, including the PPG as well as the OSCar. 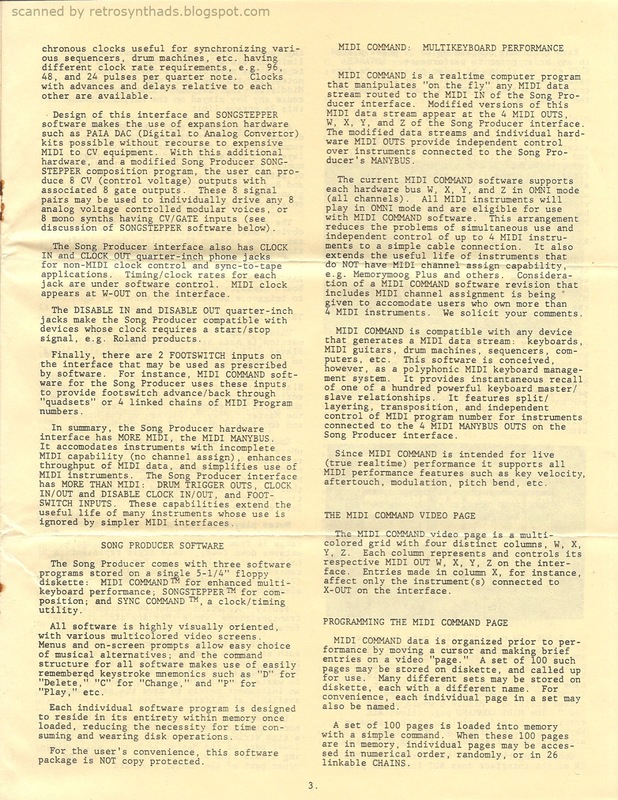 And one of the owners of Europa, Geoff Farr, who was previously an Oberheim Electronics sales rep in the 70s, went on to distribute the Waldorf Wave and Access Virus as part of the GSF Agency, where he continues to represent Tom Oberheim, Knifonium and Acoustica Audio.